I got home from Gen Con fifty-some days ago (Yes, it was – as expected – another completely fantastic trip. ), and I’m pretty sure I’m finally caught up on all my game-related writing. I played 16 games at Gen Con this year, 11 of them for the first time, plus I came home with one more game to review. My new dice and dice bag from Gen Con. Pretty sure I’m not alone in this, but since being re-introduced to D&D a few years ago, I get such a kick out of picking up new dice. They’ve become not just part of my game-playing, but little souvenirs and memory triggers, too, since I have generally only added dice to my (relatively small) collection when I’m visiting a convention, or playing in a local game store. And when it comes to dice, if you can’t find the ones you’re looking for at Gen Con, then those dice just don’t exist in this ‘verse. With my recent fifth edition Dungeons & Dragons Starter Set purchase, I needed a new dice bag, and Gen Con was the perfect place to find one. I also bought a set of oversized dice, a CritSuccess d20 spinner ring as a surprise for my wife, and added a couple free d6s courtesy of Crystal Caste (which provides an official Gen Con die every year) and Stonehaven Miniatures. Gen Con’s non-stop nature remains one of the reasons I love it so much. I love this picture that Jonathan Liu took when we were playing Machi Koro. If memory serves, it was well past midnight, and we were far from the only people hanging out and playing games in that hotel lobby. 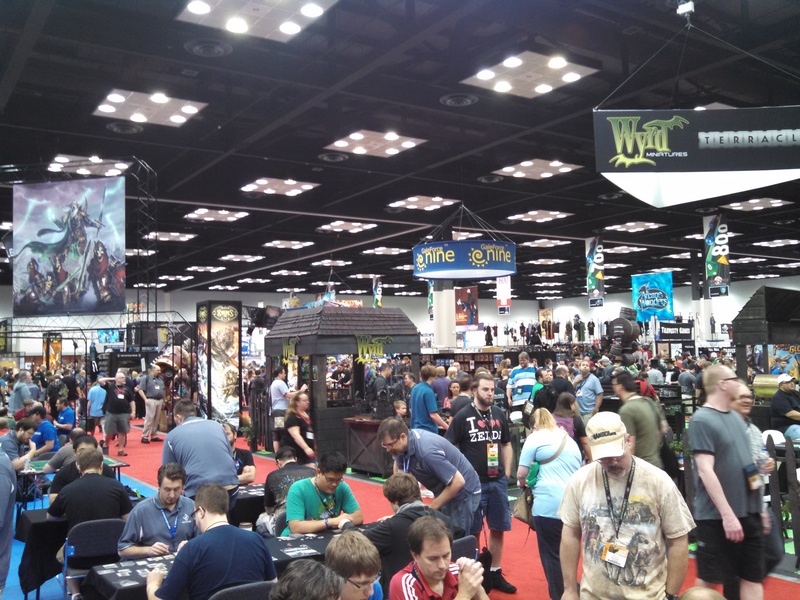 While the exhibitor’s floor at Gen Con closes every evening, several of the massive open gaming halls stay open so you can meet up for late-night Lords of Waterdeep or Lewis and Clark. And after-hours gaming at the hotels or the convention center can mean a chance to cross paths with the game designers themselves, since most of them tend to be busy during the day. We had one of the Wizards of the Coast creators stop by our table as we were playing his game at last year’s Gen Con, and this year, we wound up playing some nifty as-yet-unreleased games, simply because we were in the hall late, and Jonathan happened to see a few game designers he knew. Steve Jackson Games also sent me home with a copy of Munchkin Adventure Time, which I just wrote up for GeekDad. Dang, do I love Gen Con. Let’s do it again sometime.